Boston College 0 v 2 Pointon, Heckington Millers 1 v 2 Ruskington Rovers. FC Kirton 1 v 7 Fulbeck United, Horncastle Town Reserves 3 v 1 Freiston, Railway Athletic 5 v 1 Swineshead Reserves. Billinghay Athletic Reserves 2 v 5 Park United, Coningsby Reserves 1 v 2 FC Hammers, East Coast 7 v 1 Kirton Town Reserves, FC Wrangle OFF v OFF Sibsey, Spilsby Town Reserves 6 v 0 Fishtoft Reserves, Swineshead ‘A’ 3 v 3 Boston International. 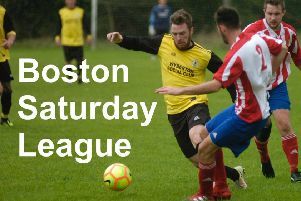 Benington Reserves 0 v 2 Boston Athletic, Boston Titans 3 v 7 Boston College Reserves, Fosdyke Reserves 1 v 2 Leverton SFC Reserves, Holbeach Bank 3 v 4 Wyberton ‘A’, Spalding Harriers 2 v 3 Old Doningtonians Reserves. Beehive OFF v OFF Leverton SFC (Beehive withdrew from the competition). Fishtoft 2 v 3 Benington, Kirton Town 4 v 4 Friskney (AET – Friskney won 4-3 on penalties), Mareham United OFF v OFF Swineshead, Old Doningtonians 6 v 1 Fosdyke, Old Leake 2 v 3 Spilsby Town, Woodhall Spa United 3 v 1 Skegness Town Reserves, Wyberton Reserves 4 v 2 Coningsby.